These travelers…won’t just be from THIS world, will they? If by “this” world you mean Midgard, then yes. Far as we know. Could you put up a link to Top Webcomics so we can vote for you? You’re kind of hard to find on there. If you do a search for Thistil Mistil Kistil you can find it, but I don’t put up incentives anymore because they got to be too frustrating to make. TWC is also so saturated with ugly, sexist ads that I don’t feel right sending people in its direction (not all the ads are like that, but enough to bother me). It’s not a true gauge of the good webcomics out there either. I’m tempted to take TMK down from it entirely, but haven’t quite brought myself to do it yet. Mostly it was the incentives though. Well, to be fair, without TWC I never would’ve found TMK. Yeah, that’s the thing kind of holding me back! People still seem to find TMK through there even though I don’t update its incentives or anything. Not sure how that works, but to get new readers it might be worth keeping it up there. The reason people can still find you is that your loyal fans (like me!) vote for you even without incentives. The ranking isn’t a really good guide of what is good, but the descriptions can be. 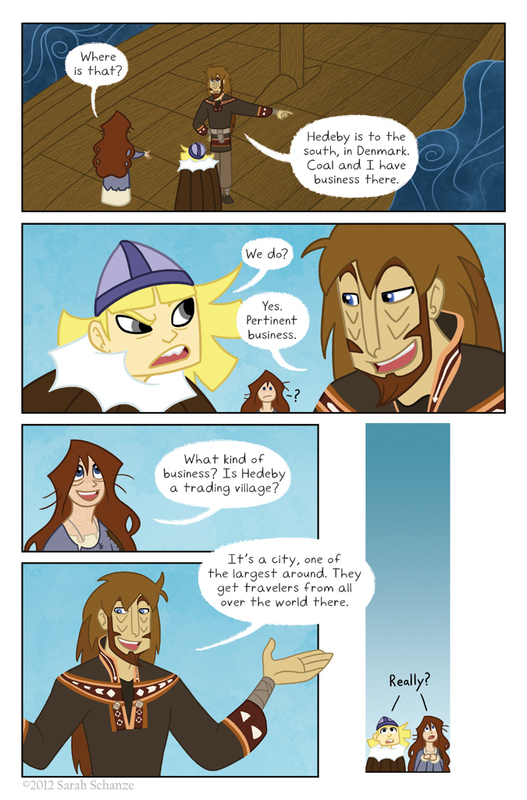 I’ve found some of my favorite webcomics, like Girl Genius and Not A Villain, through that site. Y’know, I think I’ve been to Hedeby once, to visit family I never knew I had. Nice place, from what I recall. Really cool viking museum, too, from what I can recall. Also, just to parrot a lot of other people, I do rather love the comic. You do good things and should feel good about yourself. Hedda is so cute in all of these panels! I can’t wait to see Hedeby. Are we going to get a fancy full page view of it when Loki and crew pull up? Yep! Well it’ll just be one page, not a double spread, but there will be a big ol’ page for it. It’s not really that impressive of a city though. Nothing like Constantinople or anything. XD And thank you! Great moving-the-story-forward comic… but the real laugh is in your blog post. OMG, love the image of the McStarbucks Viking metropolis! Norse settlement in modern northern Germany, ~770 A.D.- 1066 A.D. Okay, learned something new again. Nothing new about the time frame of the story though (was there some statement I missed? ), since that’s about the whole Viking Age.